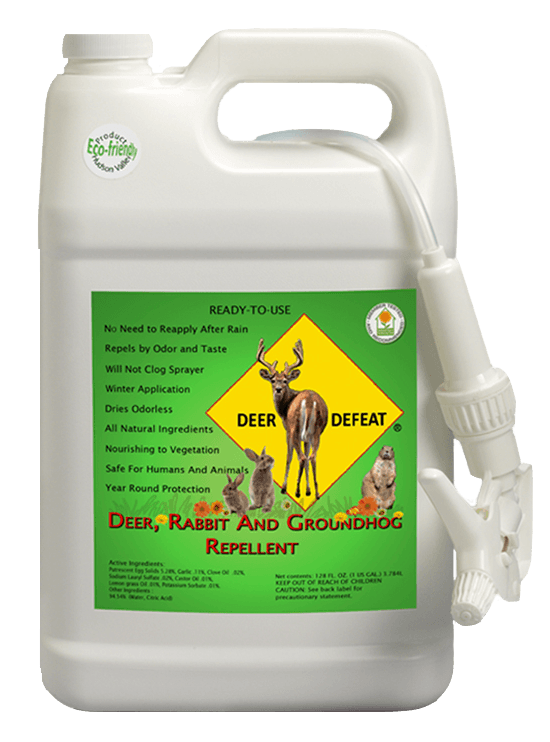 Deer Defeat is easy to apply! Watch the instructional video and read more below. Early spring is a very important time to protect your perennials that are just peeking out of the ground. 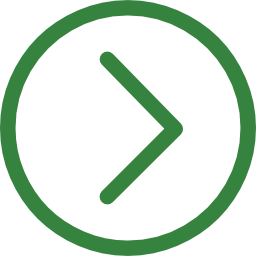 We emphasize the importance of early spraying, as it is important to protect anything green. Follow these simple steps, and you will enjoy beautiful flowers the entire season! Deer are extremely hungry after winter is over. As soon as your perennials are an inch or two high, start to spray them. During the growing season, spray every 4 to 6 inches of new growth. Once the plants are mature, repeat the spraying every 30 days. For any flowers with long stems, like tulips, hostas, lilies, and roses, make sure to spray buds as they form. If using repellent for the first time on mature plants, apply weekly for the first 3 weeks. Reapply once per month thereafter. Spray them as soon as you are done planting. 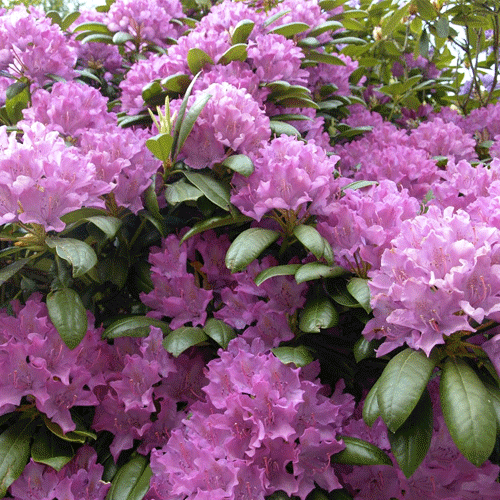 During the growing season, spray every 4 to 6 inches of new growth. Once mature, reapply every 30 days. When spraying, for best results, please make sure there is no wind and no rain in the forecast for the next 4 to 5 hours. 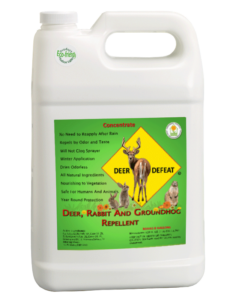 Deer Defeat will dry odorless in a 30 to 40 minutes, but will take a few hours to fully “set.” You will not need to re-apply the repellent after rainfall. Always start with a good shake of the bottle, even if using a commercial sprayer. Adjust the nozzle to a fine mist and begin spraying. There is no need to saturate the plants. Spray until you see droplets on the leaves. Always begin by shaking the repellent well. We also recommend shaking the repellent often while applying. Store repellent between 40⁰ F to 90⁰ F. Keep away from children. Small gardens: apply liberally to the grass in a 2 foot wide perimeter of the garden. Large gardens: you can spray the vegetables up to the flowering stage. Once plants start flowering, just spray the grass around the perimeter of the garden once per month. After mowing the grass, you must reapply the repellent. We do not recommend spraying directly on your leafy vegetables. Fruit trees can be sprayed up to the flowering stage. If your fruit trees are not bearing fruit, spray the trees directly. 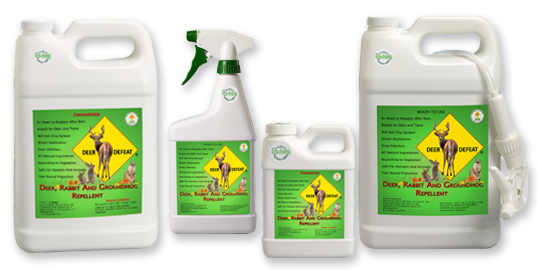 The repellent will protect, as well as nourish, your plants. If you are planting bulbs, soak them for an hour or two in the Ready To Use solution, let them dry slightly for about 30 minutes, and then plant as usual. By doing this, you will protect your bulbs from being damaged by various critters, along with giving the bulbs a boost in their growth. The solution used for soaking the bulbs can be strained through a fine mesh (to eliminate possible debris that could clog sprayer) and then poured back into the bottle, to be sprayed as usual. Deer Defeat is an excellent protection for your evergreens over the winter. Many of our customers no longer use burlap or put up deer fences. Follow these simple steps, and your plants will be protected the entire winter season! Always shake the repellent before, and periodically, as you are spraying. 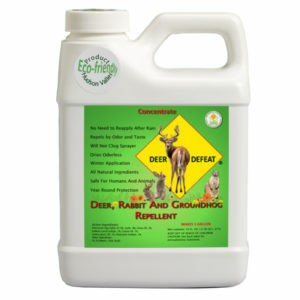 Shaking Deer Defeat is always necessary, but it is even more important in the cold winter months. Shake the bottle well, then make sure to totally coat the entire evergreen with Deer Defeat repellent. You are preparing them for a long winter’s protection. Spray the entire evergreen in late November or just before the first snowfall. Make sure you apply a second application at the end of January or early February, on a calm day, with no rain or snow for at least 4 to 5 hours. You can spray your evergreens even if the temperature is below freezing. 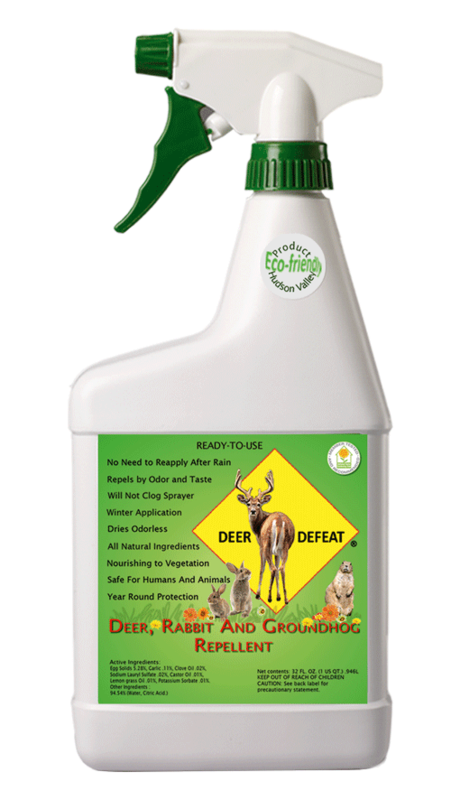 Deer Defeat repellent will dry clear and, if applied correctly, will coat your evergreens and protect them from cold temperatures and strong harsh winds during the winter months. For best results, make sure to spray on a dry and calm day with no rain or snow in the forecast for at least 4 to 5 hours. The repellent will dry odorless in about 30 minutes, but it will take at least 4 hours to fully “set” on any plants you may have sprayed. Each region has different temperatures, amounts of snowfall, and different plants that need protection. Most customers do not need more than two applications during the winter, unless you have extremely aggressive deer. In brutally cold areas, where deer are unable to find food easily because of the long snow season, make sure you pay attention to the deer tracks and their vicinity to your sprayed evergreens. This can help you determine if additional applications of Deer Defeat are necessary. Always begin by shaking the repellent well, and shake often while applying. Do not allow Deer Defeat to freeze. Store repellent between 40⁰ F to 90⁰ F. Keep away from children. We do not recommend mixing in a spray tank, as many of them are not accurately marked at one gallon. When you purchase the 16 oz. Concentrate, please mix the entire bottle at once. Use any empty well-rinsed gallon container (such as from a gallon of milk or water). Shake the 16 oz. Concentrate bottle well and pour it into the gallon container. Fill the 16 oz. container that you just emptied about half way with water and shake it well to get out all the repellent stuck to the sides of the bottle. Add that to the one gallon container also. Then, finish filling the gallon container with water to make a TOTAL of one gallon Ready To Use repellent. Shake well and pour the gallon mixture into a sprayer. If using a smaller sprayer than the one gallon, your gallon jug can be used as a storage container. 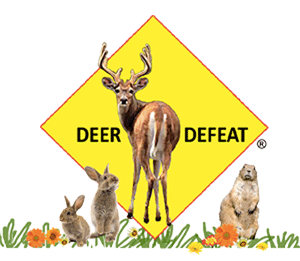 Deer Defeat has a long shelf life. If not used this season, it can be used in following seasons. » Remember to shake your Ready to Use container before, and periodically as you are spraying. When you purchase a Gallon of Concentrate, follow the same instructions as the 16 oz. Concentrate. Always shake the Gallon of Concentrate well before preparing the Ready to Use repellent. > Pour 16 oz. of Concentrate into a measuring cup to make each Gallon of Ready to Use product. > 16 oz. of Concentrate is part of the Gallon mixture (16 oz. of Deer Defeat to 112 oz. of water). Ready to buy? Have a question?